The Deputy Director General for Operations, at the National Lottery Authority (NLA), Neved P. Kortu has cautioned actors within the gaming sector to protect the interest of Players in keeping with sessions 7.4 and 7.5 of the NLA statutory rules and regulations. 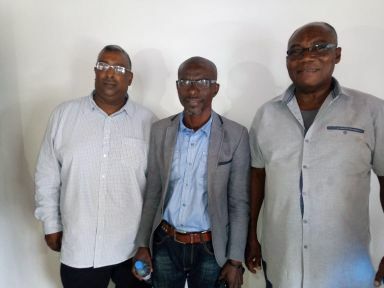 Mr. Kortu made the assertion over the weekend when he and team of experts from the NLA’s Department of Monitoring and Evaluation visited JUGS GAMING Incorporated Head Offices in central Monrovia in a bid to ensure full compliance with the Authority’s rules and regulations. JUGS GAMING Incorporated is a major gambling institution mainly involved with raffle draws and other games of chances in Liberia. The entity, (JUGS GAMING Incorporated), is expected to give away a modern house located in Brewerville with a tagged value of US$25.000.00 through a raffle draw in January 2019. The NLA Deputy Director General for Operations urged the Management to ensure that JUGS GAMING Incorporated acquires all documentations from NLA as required in keeping with its statutory mandate before venturing into the planned raffle draw. The NLA Deputy Director General however instructed JUGS GAMING Incorporated to submit to the institution names and contact details of those who will purchase tickets for the January 2019 raffle draw and further publish the full listing in local dailies for verification. Director Kortu said such measures would ensure high trust, protection, transparency and integrity to the process. Also, JUGS GAMING Incorporated Chief Executive Officer, Yuvo Govender assured Director Kortu and team of closely working with them every step of the way to ensure checks and balances.